Chubb Samaggi Insurance PCL (Chubb), in collaboration with the Accident Prevention Network (APN) with the support of the Thai Health Promotion Foundation (ThaiHealth) and Thung Song Hong Police Station, kicked off the “Songkran Road Safety”. This initiative is is part of the company’s ‘Use Rear Belt for Safety’ project to encourage backseat passengers to fasten their seat belts for safety. At present, the majority of front seat passengers are use to wearing their seatbelts, whereas the vast majority back-seat passengers do not fasten their seatbelts, . This is a leading cause of road fatalities and property damage during the holiday season, especially the long Songkran celebrations. 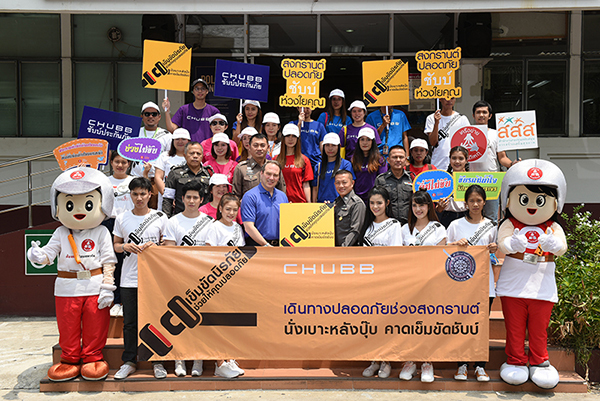 Chubb initiated the ‘Use Rear Belt for Safety’ project with the aim of encouraging Thai people to wear their rear- seat belt to improve road safety and reduce the death toll from road accidents. It promotes rear-seat belt usage to comply with the land transport law enforcement for the safety of every passenger and all road users. To sustain the momentum of the ‘Use Rear-Seat Belt for Safety’ project, the campaign commenced with the ‘Songkran Road Safety’. In this initiative, Chubb joined forces with the Accident Prevention Network (APN) and Thung Song Hong Police Station team to raise awareness of road safety by distributing a series of promotional materials, such as car stickers and window suckers at Laksi intersection prior to the advent of the Songkran festival. The aim is to remind all passengers about fastening their rear-seat belts while traveling during the Songkran holidays. This is a peak period for road-travel often leading to a spike in road deaths when many people travel back to their hometowns. Prommin Kantiya, Director of the Accident Prevention Network (APN), said “Safety belts reduce the impact of a potential car accident for drivers and passengers. Wearing a seat belt will prevent death and serious injury in a car accident as it prevents drivers and passengers from being ejected and strongly hit. Seat belts reduce the risk of death by 34%. Currently, a larger number of drivers and passengers feel that it is unnecessary to use the back-seat belt. If an accident happens, they will have a high chance to fall out of the car and be seriously injured. So, fastening seatbelts when seated is so essential that all motorists should pay attention to when riding on the road. In Thailand, Chubb Samaggi Insurance Public Company Limited provides a comprehensive range of insurance solutions for individuals, small to medium-sized businesses, as well as multinational corporations. As a key player in the local general insurance market, its product offerings include Accident & Health, Fire and Property, Motor and Specialty insurance products to retail clients. In addition, Chubb Samaggi provides Property, Casualty, Construction, Marine and Financial Lines insurance for corporate clients. Chubb Samaggi offers its products and services through a multitude of distribution channels of which direct marketing is its forte. Other channels include banks, brokers, agent and a branch network nationwide. The company’s market leadership position is largely attributed to its strong partnerships with financial institutions as well as leading companies, the clients and employees of which benefit from tailored protection policies.